What were the most popular news from the Cycling Embassy of Denmark? We have had a look at what our readers liked the most in 2015. Here’s our Top 10 in case you missed them. How many Danes bike? And why are the Danes so keen on cyling? These are a just a few of the FAQs, the Cycling Embassy of Denmark gets on a regular basis. The latest data from the Danish National Travel Survey provides some of the anwers. New study by the Danish Cyclists’ Federation and IS IT A BIRD show that all groups of road users experience inappropriate behavior from some cyclists. Children learn best through play. This goes for cycling as well. So, the Danish Cyclists’ Federation is thrilled to announce that they have been granted funds to co-finance the construction of 10 permanent bicycle playgrounds around Denmark over the next three years. 7. How To Get More People Cycling – Every Day! In 2013, the Danish Cyclists’ Federation received funding from the Danish National Cycling Fund and set out to investigate how to get people to choose cycling as their daily mode of transportation, and how to keep them in the saddle. 2014 became the year when Copenhagen got its first bicycle street. It started out as a part of a traffic experiment in the city centre. The problematic behaviour of cyclists has received an increasing level of attention in the Danish media over the past few years. But what are these problems actually about? And why can’t the cyclists just behave better in traffic? Bicycle thefts are a great nuisance for cyclists but what can be done to stop them? We have taken a look at the two most prominent bicycle nations: the Netherlands and Denmark. How have Danish city planners managed to convince politicians to spend money on bicycle infrastructure? The answer partly lies in the way the Danes do economic analyses. After all, calculations and numbers are the politicians’ best friend. 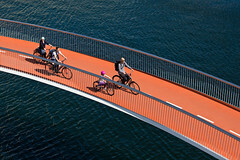 The Municipality of Copenhagen have published their new bicycle account for 2013-2014, and it shows positive results. Almost 50% of those who work or study in Copenhagen arrive by bike.